Grandmothers across the globe play a far more important role than the go-to babysitter on date night. As it turns out, we've learned that grandmothers are vital to not only caring for young children but also advising and educating younger women in their communities on all aspects of family well-being. Grandmothers across the globe play a far more important role than the go-to babysitter on date night. As it turns out, we've learned that grandmothers are vital to not only caring for young children but also advising and educating younger women in their communities on all aspects of family well-being. Interestingly, in the developing world, the influence of grandmothers even extends to the men in their communities as well. The work of the Grandmother Project and World Vision has demonstrated that when grandmothers are acknowledged, included and given access to new information, their commitment and contribution to family and community health and well-being increases. Empowering grandmothers; enhancing communication between grandmothers, younger women and men, and strengthening the role of grandmother groups can also contribute to strengthening understanding and social cohesion within families and communities. When it comes to the health and nutrition of mothers and their children, grandmothers play a vital role in providing support during pregnancy, labour, delivery and the postpartum period. And we know that because of all this, grandmothers have a significant influence on maternal and child health and nutrition practices. Despite this influence, grandmothers are often ignored as a resource for advancing the goals of health and nutrition programs. Adequate nutrition during pregnancy, infancy and early childhood is critical to ensure optimal growth, development and survival of children. Children weakened by malnutrition often die from diseases that are both preventable and easy to treat, such as diarrhea and pneumonia. Those lucky enough to survive often suffer frequent illnesses and reduced opportunities for education and income earning. Young women with a history of malnutrition tend to have more difficulty in childbirth and give birth to smaller babies, thus perpetuating a cycle of malnutrition. In Sierra Leone, maternal and child malnutrition persists at high levels with long-term impacts on the nation's social and economic development. Starting in 2013, World Vision began empowering grandmothers in Sierra Leone to be positive agents of change in their community. Known as Mamanieva, which means "for grandmothers" in Mende, the innovative project implemented a grandmother-inclusive approach to social and behaviour change for nutrition. This approach builds on the culturally-designated role of grandmothers as advisors and caregivers. It aims to strengthen grandmothers' knowledge and self-efficacy to promote positive health practices in the community. In the approach, community members are supported to analyze the role, relationships and influence of specific family members in their community, and as a result come to recognize the important roles that grandmothers play. Grandmothers are then publicly recognized and praised through intergenerational community sessions that highlight the positive roles of grandmothers in the community when it comes to maternal and child health. Relationships between daughters and mothers-in-law are improved - this is demonstrated during the praise sessions, when daughters or young mothers are given the opportunity to openly praise the grandmothers through a song, performing a skit or dance, or making a speech. Through this process, grandmothers not only acquire more confidence but are also strengthened in their traditional role within the community. 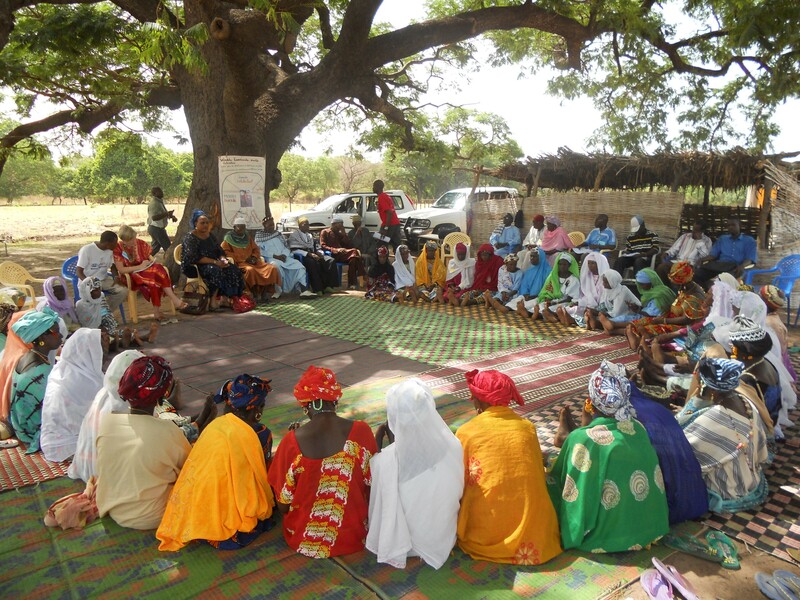 Monthly participatory dialogue sessions are also held with grandmothers to promote key nutrition messages. Finally, intergenerational forums in which grandmothers and young mothers come together for dialogue on nutrition and health issues are held. As a result, grandmothers in project sites were empowered and had higher self-efficacy scores compared to grandmothers in non-project communities. One grandmother explained her sense of pride by saying "We feel that we are important. We are assigned a particular duty and we feel a sense of belonging." Overwhelmingly, the community responded that they had greater respect for grandmothers as a result of the project. Not only were grandmothers themselves empowered, this recognition gave a voice to all females in the household, permitting a more enabling household environment for women to put recommendations into practice. Communities also perceived that the improved relationships resulting from the grandmother -inclusive approach facilitated more effective transfer of knowledge to daughters. At the close of the Mamanieva project, 90% of grandmothers in project communities understood issues of proper nutrition for mothers and babies, significantly more than in non-project communities. This knowledge was clearly transferred to pregnant women and mothers as significant improvements were observed for improved nutrition practices during pregnancy and for infants and young children. What's more, women had less complications in their pregnancies and gave birth to healthier babies. Even men in the community recognized the amazing power of empowering women - male community members credited the project with decreasing maternal death and improving child health. The impressive results have received national attention - the Scaling Up Nutrition (SUN) national coordinator, Dr. Mohamed Foh, encourages more engagement of grandmothers "Our story will not be complete nor successful, if we do not include the grandmothers. Sierra Leone has signed up as a SUN Country and is moving forward. The grandmothers should not be left out." Based on the findings of high overall acceptability and effectiveness, the grandmother-inclusive approach has great potential. Future nutrition and child well-being programmes must consider familial and community relationships and how strengthening these through intergenerational dialogue and community praise forums may improve programme effectiveness. A grandmother-inclusive approach is not exclusive to nutrition. Research in other contexts have highlighted the potential effectiveness of the approach to address other child well-being domains, including early child marriage and genital cutting. The amazing impact grandmothers have on their communities should remind us all to be thankful for these women in our lives. So the next time your mother or mother-in-law is driving you crazy, remember all the incredible benefits they provide the world over. Quite possibly, they have a far bigger impact here at home than most of us realize. Melani O'Leary is Regional Health and Nutrition Technical Specialist, Carolyn Macdonald is Nutrition Director and Bridget Aidam is Senior Research and Evaluation Advisor at World Vision Canada. Find out more about this innovative initiative and hear from the grandmothers themselves here. The views expressed are those of the authors and do not necessarily reflect the views of CCIC or its members.